On 4th December 2016 the Cutlers’ Company will be celebrating the 600th anniversary of the granting of the company’s first charter by Henry V. The Worshipful Company of Cutlers was established by ordinances in the fourteenth century with the Hall located on Cheapside. The Cutlers’ Company has come a long way since that time – with one of the major milestones being the granting of the charter. The Company was the only one to be granted a Royal Charter in the wake of Henry V’s victory of the Battle of Agincourt. The Company is planning on celebrating the anniversary in a number of ways throughout the year. The Company will be inviting fellow livery companies to a celebratory service at the church of St. Bartholomew the Great on 5th December 2016. There will also be an exciting national Cutlery Design Competition during the year held in conjunction with the Institute of Making at University College London, with prizes being awarded on 16th of September. The very prestigious Feast of the Boar’s Head will be held on 7th December 2016 in the Great Hall at the Guildhall. The Violence Reduction Service is a program that offers timely and tailored support to stab victims so that they are able to establish lifestyles that move them away from gang activity, violence and crime. It is aimed at 11-25 year olds, and at the lower end is engaged with diverting ‘at risk’ youths from gang involvement whilst at the upper limit working with individuals who might already be entrenched in gangs and help them disengage from them. It is a sad fact that many of those who are victims of knife crime then go on to become perpetrators or victims for a second time, sometimes fatally. The programme enables caseworkers to engage directly with victims of knife crime when they are on the trauma ward, and away from negative influences, enabling them to evaluate their choices, and make a real change in their lives. The scheme then provides ongoing support, helping with issues such as employment, housing and family issues. The programme works in conjunction with St. Giles trust, who have an excellent track record in rehabilitating offenders, and was initiated by Mr. Martin Griffiths, a former Cutlers Surgical Fellow, who works as a consultant vascular and trauma surgeon at the Royal London hospital. 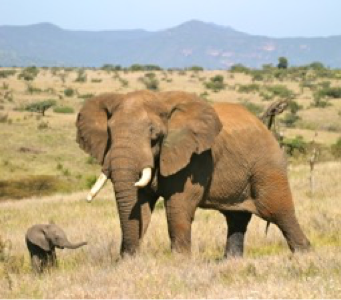 The African elephant population has crashed from 1.3million in 1979 to approximately 400,000 today. On average, one elephant is killed every 15 minutes with a devastating impact throughout the continent. Tusk is a dynamic and pioneering organisation that has become a highly effective and efficient force in African wildlife conservation. Over the past 25 years the charity has invested £25m into a successful portfolio of wildlife protection, community development and education programmes, providing lasting benefits to the people and wildlife of Africa. It currently funds over 50 projects across 18 countries. As the human population in Africa increases the inevitable demand for land often leads to conflict with wildlife. Tusk’s holistic approach recognises that the future of the continent’s natural heritage is as much dependent on improving education as it is providing protection. Originally devised at Stoke Mandeville Hospital, UK, competitive wheelchair fencing was first introduced in 1953 and has been a Paralympic sport since Rome in 1960. 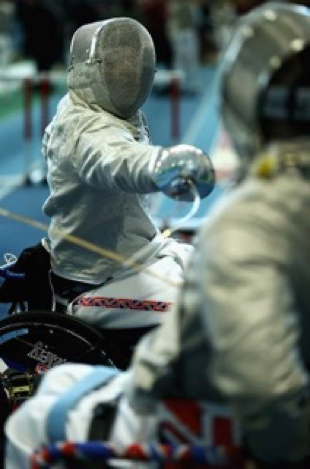 Fencing is one of the few personal combat sports that can be successfully practised from a wheelchair. The rules are exactly the same as in the able-bodied sport with a few minor additions to cover the complications of fighting from a chair. The British Disabled Fencing Association has something for everyone, whether as a social activity, a regular workout or providing the path to becoming a Paralympic champion. Great Britain has enjoyed recent success winning 6 Gold, 3 Silver and 4 Bronze medals in International competitions in 2014/15, culminating in 2 Silver medals at the recent World Championships.